Where Did My Returned Inventory Go? I have a problem with refunds on Amazon. I understand that one of the buyers of my books returned it to Amazon and Amazon subtracted the amount paid from my balance… But where is the book itself ? I cannot find it in my inventory. Even books that were refunded at the beginning of January are not showing up? Can you tell me where to find those books, and get them in my sellable stock again? Not to worry, this is exactly how Amazon handles it. So, right now you’ll be getting lot of refunds as students who buy books realize that they don’t need the book even though it’s on the syllabus, or they can share one, or whatever. A 5% return rate is on the high side but still well within bounds. Because Amazon has an automate return system, students typically get a refund as soon as their parcel is registered in the UPS system — the return is issued the day it is MAILED, not the day it is received and checked in by Amazon. So you may not see it back in your inventory for upwards of a week. When it is received by Amazon FBA, of course, they may flag it as unfulfillable because it sustained damage in transit. 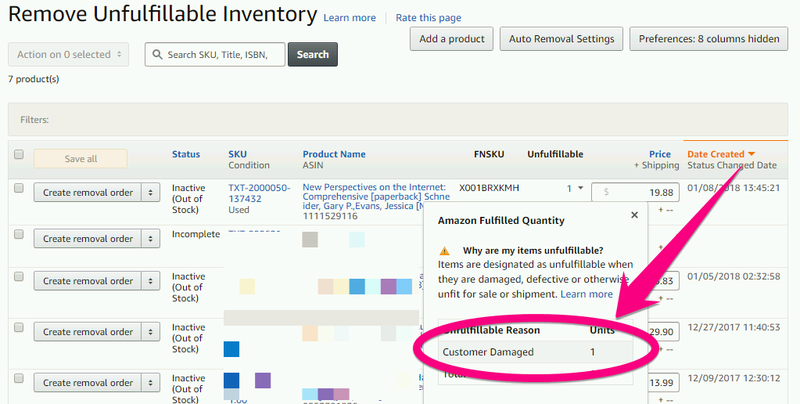 So books refunded at the beginning of the month may be in the Unfulfillable Listings page which you can find at Inventory>Manage Inventory >Remove Unfulfillable Inventory. 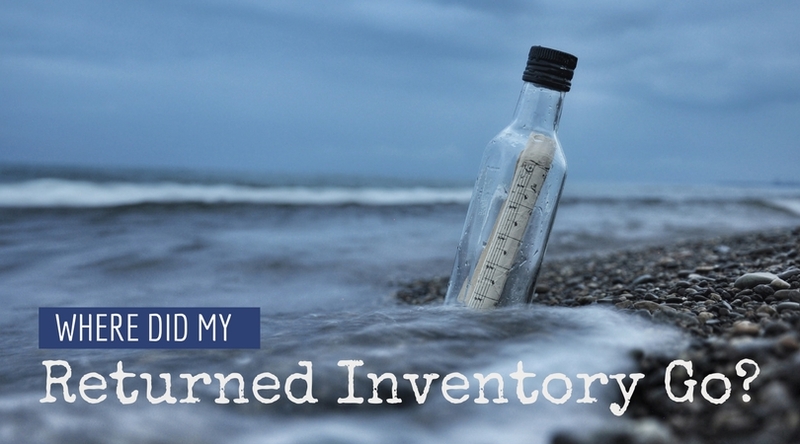 It may be under Stranded Inventory sometimes as well, but usually it’s in Unfulfillable. Click on the dropdown arrow next to the 1 under ‘Unfulfillable’. It will tell you if “Defective” “Customer Damaged” or “Warehouse Damaged.” If the latter, Amazon will ship it back to you and reimburse you in its own sweet time. You can put in a ticket to hurry them along. But the former two, you need to have them shipped back to me for inspection and reshipment. This costs $.50 on for Amazon to ship and $1 for us to inspect. Or you can have them destroyed for $.15 but I’m sure they’re worth more to you than that. The books are not always or even usually defective; in order to get free return shipping, customers often choose the “defective” selection when creating a return, and I suspect it’s up to the generosity of the Amazon checker whether the books are inspected or simply automatically dumped in the defective pile. There is a service that helps you track returns that should have made it back to your inventory but didn’t. They charge a percentage as a finders fee, but I run the report about 2x/year for the peace of mind. 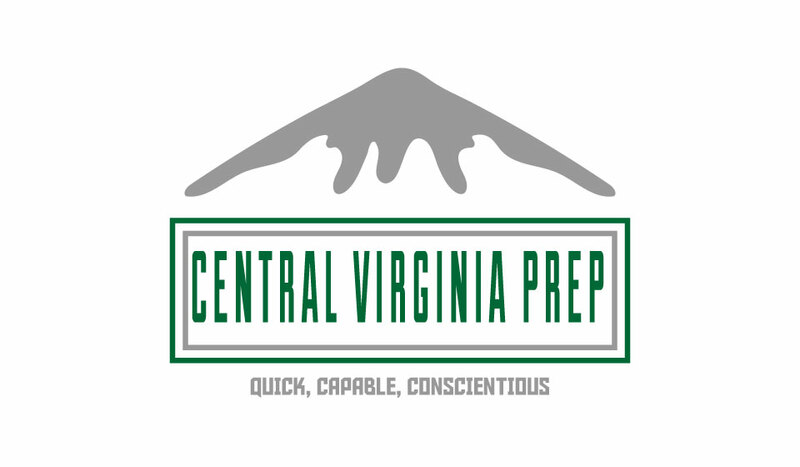 When I was doing this, after each sale went through, I would have my VA reprice the sold book to $500. That way whenever a “live” book was priced at $500, I would know that it was a return, and I would be able to reprice it correctly without having to worry that I was having books land in my inventory at old, stale prices and potentially get sold well below market value. Set up a weekly reminder to check for Unfulfillables in order to get inventory live again as soon as possible.